The acting director of the US Bureau of Alcohol, Tobacco and Firearms (ATF) and the US attorney in Arizona are resigning over a botched operation to track the flow of guns to Mexico. 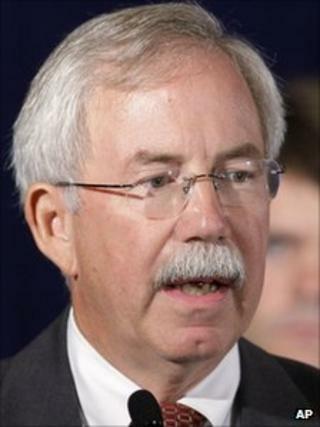 The ATF's Kenneth Melson had recently faced pressure by Congress to resign. Operation Fast and Furious saw US agents allowing thousands of guns into Mexico illegally with the hope of tracing them to major arms dealers. But hundreds of guns went missing and dozens have turned up at crime scenes. The operation never led to any arrests. The US attorney in Minnesota, B Todd Jones, will replace Mr Melson. "As a seasoned prosecutor and former military judge advocate, US Attorney Jones is a demonstrated leader who brings a wealth of experience to this position," said Attorney General Eric Holder in a statement on Tuesday. Mr Melson will be reassigned to the Department of Justice's Office of Legal Policy as an adviser on forensic science, Mr Holder added. Arizona US Attorney Dennis Burke is to be replaced on an acting basis by his first assistant. President Barack Obama has said that neither he nor Mr Holder authorised Operation Fast and Furious, which has sparked outrage across the US and Mexico. Tuesday's shake-up came weeks after a Congressional report showed that at least 122 weapons recovered at crime scenes in Mexico had been linked to the sting. A congressional investigation heard evidence that out of more than 2,000 weapons linked to Fast and Furious, some 1,400 have not been recovered. Two of the weapons were found in Arizona in December at the scene of the killing of a US border patrol agent who was trying to catch gangs who target illegal immigrants. When he testified to congressional investigators in July, Mr Melson acknowledged mistakes had been made. Authorities had hoped they would be able to follow the guns to drug cartel leaders. But ATF agents did not track the weapons after they were transferred from buyers to others who smuggled them across the border.